This system is economically priced and features a binocular stereo zoom body with a 45° angle and an interpupillary distance adjustment range of 55 - 75mm. The zoom is continuous and parfocal with a 5:1 ratio, 0.75 - 3.5x objectives and a working distance of 80mm. A pair of high wide field 10x eyepieces, 30.5mm O.D. (with a 20mm field of view) is supplied making the magnification range 7.5x - 35x. The universal boom stand is very sturdy and requires no counterbalancing. The base dimensions are 10" x 10", with a 14 3/8" vertical arm and 20 3/8" horizontal arm, weight of the stand is 37 lbs. This system is ideal for OEM, industrial and life science applications. Comes with a manufactures five year warranty. It is recommended that this system be purchased with the .5x aux lens. This will increase working distance from 3.2 inches to approx. 6" 150mm. 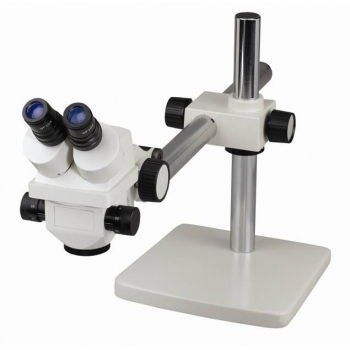 Click the button below to add the Accu-scope 3061 Stereo Microscope on Boom Stand to your wish list.